I looked at the yin-yang symbol for nearly a decade and always thought I understood the hidden dynamic. Rooted in Chinese philosophy, are often thought to be opposing forces versus complimentary forces. Others propose a more defined view, that everything has both yin, the darker, more passive force, and yang, a more active positive force. The message insinuates that yin cannot exist without yang. Vice versus, yang cannot exist without yin. Lastly, some taught that neither yin nor yang could exist without the other. I refined my personal perspective after watching the film Rogue One: A Star Wars Story and Star Wars: The Last Jedi. In Rogue One, we learn that the same material used by the Death Star to destroy planets also powered the Jedi’s light saber. In The Last Jedi, Rey learned the Jedi hold no exclusivity rights to the Force, for the Force is in everything and everyone has equal access. Thus, as Christ would say, each one of us has the ability to accomplish what Christ did and more. Moving forward, I ask the following question: “What if there is neither a yin nor yang?” What if the world’s yin and yang happen to be derived from the same one life force? What if our own personal yin and yang are derived from the very same force? If true, what becomes of yin and yang? I propose both yin and yang are breathed to life via personal choice. All of us, will at times, choose yin. Likewise, all of us, at times choose yang. Christ talked of such a view in Matthew 15:19,”For out of the heart come evil thoughts – murder, adultery, sexual immorality, theft, false testimony, slander.” The challenge lay in choice. 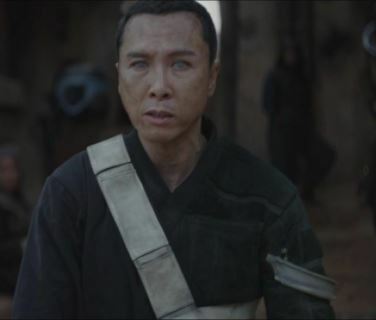 In Rogue One, the blind spiritual master Chirrut Imwe, was in constant dialogue with “the force” as he chanted “I am one with the force, the force is with me.” We must be in constant dialogue with the Father if we want to know what he wants us to do and where to go. I conclude from the story of a Cherokee grandfather teaching his grandson about life. So, which will you feed? The yin? Or the Yang?